Vases There are 4 products. 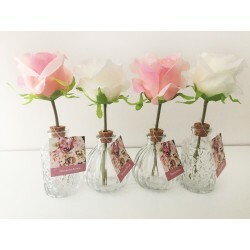 Satin Rose Glass Vase A pink or white beautiful satin rose in a shaped patterned clear glass vase. This range not only has the natural beauty of real flowers with their vibrant colours, it has the benefit of no maintenance. This fantastic rose is perfect for any occasion. 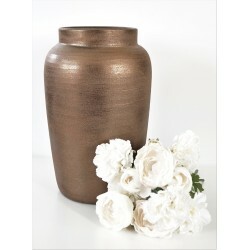 Copper Terracotta Vase HANDMADE in Portugal A tall, handmade terracotta vase with a rich copper metallic finish. Feather Design Porcelain Vases set of 3 Porcelain vases with pretty feather design in an set of three. 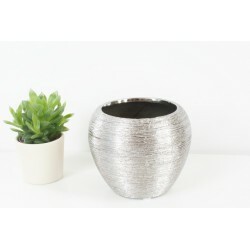 A chic and stylish silver decorative vase. This item looks stunning you can pick of our artificial flowers.